Slate is one of the most sought-after roofing materials on the market, today; it’s ability to add sophistication and value to any home is prized by many. While slate is frequently used on some of the oldest houses on the market – updating their roof without updating the overall aesthetic of the home – slate roofing can bring value to modern homes as well: not only in appearance, but by protecting your home from some of nature’s harshest elements. Slate roofing is made of stone and has been used as a roofing material for centuries. While our homes have evolved over time, the benefits of slate have remained largely the same. Its durability and natural resistance to fire make it an ideal material for covering your home. It can offer you protection from a variety of conditions; from wind, hail, fireworks, and more. Because slate is so durable, it’s also one of the most long-lasting roofing materials. While the typical roofing system lasts 20 to 30 years, slate roofing can last a staggering 100 years! With proper installation and maintenance, slate is the roofing solution that can literally last a lifetime! That’s a lifetime without the stress and worry of when your roof will need to be replaced next. Because slate is a type of stone, it often comes in a elegant shade of grey. While this is selling point for many customers, slate roofing also comes in a variety of other colors and styles for those who may have a difference look in mind. The diversity of this material – with its variable colors, sizes, and thicknesses – makes it a wonderful roofing solution for those who may have an exact vision for their home’s outward appearance. Of course, every roofing system has its disadvantages. For slate roofing, one of the most greatest disadvantages is its cost. The cost is not only determined by the material itself, but by its difficulty to install. Because tiles have a tendency to break when walked on, they require an experienced roofer who will use care during the installation process. Another challenge with slate tile is the weight. 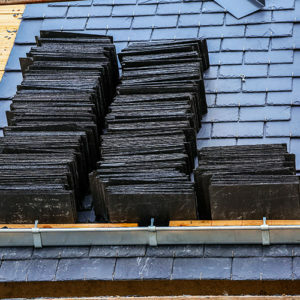 A slate roof can easily add 700 – 1000lbs to your roof, which demands an inspection of your home’s structural integrity. Depending on the results of this inspection, your home might require additional reinforcements to sustain weight of all that slate! The construction and materials required to accomplish this will also add to the cost of the project, which homeowners should be conscious of. Of course, for many people, slate roofing is considered to be an investment. While it can be costly up front, its many benefits tend to pay for themselves overtime. Slate roofing not only protects your property from leaks, fire, and weather damage; it add to your overall property value! For homeowners who may one day sell their property, slate roofing can be an incredible feature to discuss with buyers.